Founder of Process Oriented Psychology in London in April 2019! Amy and Arnold Mindell are coming to London on April 27 & 28th with their workshop “Your dreams, body and Dark Energy: the dreambody’s message for our world”. I look forward to see and learn from them! The London edition of POP Creations Festival is now over. This was a big success and I would like to thank all the participants, trainers and partners for making it an unforgettable, intense weekend. Now the time has come to focus our attention on France where POP Creations start this Saturday 7th October. I will be there to run a workshop ‘Superhero in me’ about finding our inner powers and I will also facilitate a group process about human relationships. The French edition of POP Creations is coordinated by Joanna Caffo. 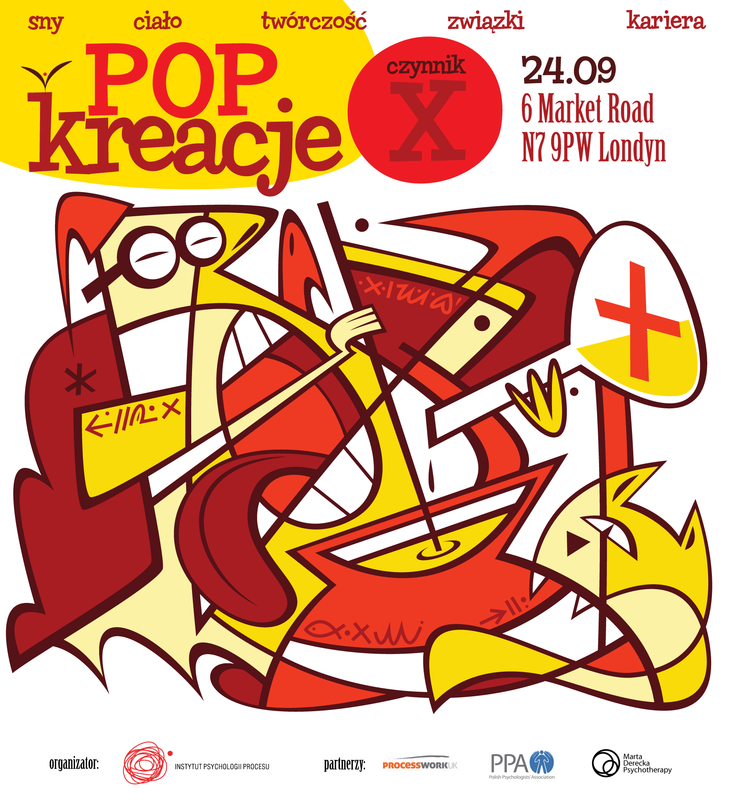 POP Creations Festival is an annual event organised since 2007 by Institute of Processwork in Poland (IPP) in many polish cities and recently also abroad. The year we are happy to announce London’s second edition of the festival! POP Creations is not only a brilliant opportunity to widen your knowledge about processwork, but also a chance to take part in many interesting psychological workshops, lectures, group processes and other attractions. The partners of this years’ London edition are Processwork UK and Polish Psychologists’ Association. We are happy to announce that this year POP Creations are coming to London! On Saturday, 24th September we would like to invite you to an introductory presentation about processwork and its evolution, presented by Jean-Claude and Arlene Audergon, founders of Processwork UK. You will also be able to take part in three processwork workshops, run by Sonia Slany, Marta Derecka, Anup Karia and Stanya Studentova. The day will be concluded with an hour of networking and a film night. 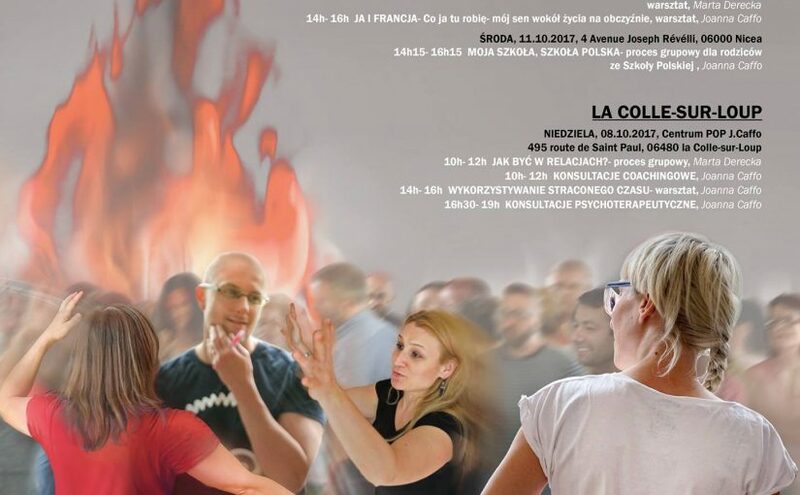 Both events are organised by Polish Psychologists’ Association (PPA). On Sunday, 25th September there will be a set of workshops prepared by PPA. There will be a small entry fee of £7 for each lecture/workshop (£5 for members of processwork community and members of PPA). The Festival is a non-profit event and all income will be used solely for organisational purposes. Networking and the film night will be free for everyone to attend! Jean-Claude Audergon, MSc, UKCP reg. Arlene Audergon, PhD, UKCP reg. We will present the history, theory and examples of how processwork is applied – its evolution from working with the relationship of mind-body (dreambody), to working with communication, altered states associated with mental health, remote states such as coma, and working with couples and small and large groups, organisations and communities dealing with collective and current issues entangling people in dispute and conflicts. It will include a ‘live’ demonstration of the work. Processwork or Process Oriented Psychology is in the words of its founder Arnold Mindell, ‚a daughter of C.G. Jung’s analytical psychology’ and has additional roots in indigenous cultures and shamanism, Taoism, and in physics. Processwork has a unifying paradigm, linking its many facets and applications. At the heart of processwork is the creativity of nature. Even the most disturbing processes can carry seeds of an emerging or evolving process. Its theory and methods allow the facilitator to track and unfold systemic dynamics at different levels, intra-psychic, relationship and group. Applications include working with dreams, body symptoms and illness, near-death experiences and coma, trauma, anxiety, depression, bullying and abuse, working with relationships, teams and organisations, working with communities, and dynamics of privilege and prejudice in issues of racism, xenophobia, gender, sexual orientation, education, economics, language, age and more. Jean-Claude Audergon, MSc is a co-founder of Processwork UK, as well as the original Process Work School in Zurich, FGPOPCH, and the Process Work Institute in Portland, the Processwork psychotherapy training in Slovakia, and the Processwork Moderation in Berlin. Jean-Claude joined Arnold Mindell in 1977 and has studied, researched and taught Process Work since its beginnings. With a group of colleagues, he initiated IAPOP – the International Association of Process Oriented Psychology www.iapop.com. He then organized and coordinated the first IAPOP conference in 2007 as well as Worldwork 2008. Jean-Claude is in private practice in NW London, consults and works with individuals, couples, communities, faith-based, social and business organizations, and facilitates community forums. Together with his partner and wife Arlene, he is a lead teacher in the Processwork UK training as well as in the CFOR Force for change ‘Facilitation for Leaders’ course. CFOR is a Charity dedicated to facilitating conflicts, disputes and postwar trauma in countries that have been hit and devastated by war and genocide (Croatia, Rwanda, South Africa). Jean-Claude is the author of ‚ The Body in Process Work’, in Totton N (Ed) New Dimensions in Body Psychotherapy, Open University Press 2005 and several articles about Processwork. Arlene Audergon, PhD has been a psychotherapist and conflict resolution facilitator for 30 years. She did her MA and PhD in Psychology and trained with Mindell in Processwork in Zurich in the 80’s. She teaches Processwork in London and internationally and has a private practice in London as a therapist, mentor, supervisor and consultant. With her partner, Jean-Claude, she co-founded Processwork UK, the school of Process Oriented Psychology in the UK. She also co-founded CFOR, an organisation devoted to developing new models of conflict resolution and violence prevention, as well as to facilitating communities to resolve complex problems. CFOR’s main work includes facilitating dialogue about the history of tyranny and violence in Europe and our future as multicultural societies, and conflict resolution and recovery in post-conflict zones including the Balkans, South Africa, and Rwanda and the Great Lakes. Arlene is author of The War Hotel: Psychological Dynamics in Violent Conflict, Wiley 2005, as well as numerous articles and chapter contributions about Processwork, conflict resolution and peace-building, community-wide trauma, mental health, and theatre. Arlene also developed methods of applying Processwork to theatre, and has worked with lots of actors, improvisers, puppeteers, writers and musicians, and co-directed and devised ‘Spirit’ with Improbable theatre. In an earlier career, Arlene was Director of services, and advocate for deaf-blind adults and the development of a thriving deaf-blind community in Seattle. 20 minute presentation on inner critical figures that haunt us. 70 minutes of process work exercises to explore our relationship to our own inner critics. These will include partnership work noticing the others critical voice; finding and developing this figure, noticing its quality and using that quality in a different way for a current troubling life issue. Feedback into the group for 30 mins. Having trained as a classical musician since nine years of age, Sonia has much life experience of this perfectionist critical voice. She was inspired to create this workshop from seeing the damage that music competitions inflict on young people who are plagued by their critics, yet have little understanding or relationship with them. She is an advanced phase two student of Process Work, bringing in her psychotherapy and creative skills to this much needed area. W poszukiwaniu uśpionej mocy – czyli superbohater we mnie! A może istnieje sposób, by to zmienić? Warsztat przeznaczony jest dla wszystkich, którzy marzą o realizacji swoich planów i pragną dowiedzieć się więcej o swojej uśpionej mocy. Marta Derecka is a psychologist and a process-oriented psychotherapist. She is certified to work with individual clients, couples and groups under the supervision of a licensed teacher of Process-work. She originally comes from Gdańsk, Poland. At the moment Marta is living and working in London, where she has her private psychotherapy practice. She works both in English and Polish languages. Marta is especially interested in helping people with emotional and relationship problems. She is experienced in working with children and families and people with mental health problems. Marta is enjoying long walks in the city and in the nature. She loves travelling. She also likes horse riding, cycling, running, yoga and reading books. Anup Karia is a psychotherapist, clinical supervisor and trainer. He’s the Director of Programmes and faculty member at ProcessworkUK (UKCP accredited psychotherapy training programme). He works as a group/organisational consultant and facilitator and teaches in the UK, Czech Republic and has a private practice based in London working with individuals, couples and groups. Stanya Studentova is a psychologist, psychotherapist, clinical supervisor and trainer. She is a faculty member at ProcessworkUK and a Clinical director at a Mental health counselling centre. She works as a group/organisational consultant and facilitator and teaches in the UK and in Europe and has a private practice based in London working with individuals, couples and groups. She is also the Director and faculty member at IPOP School (Processwork in Czech republic). Workshops prepared by Polish Psychologists’ Association. 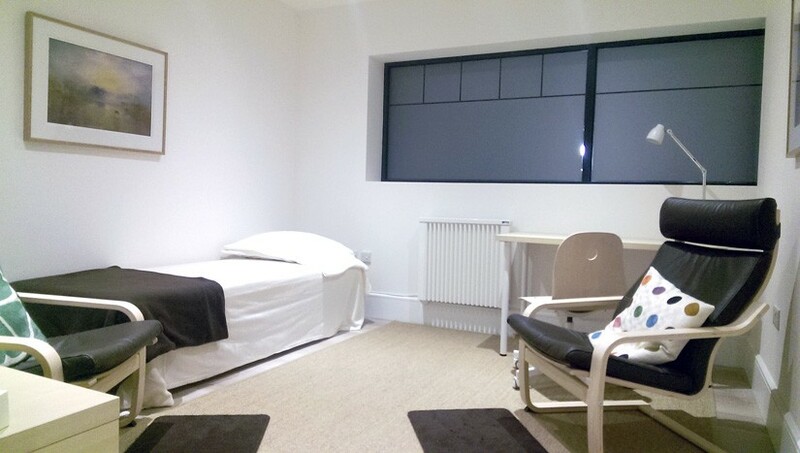 A new psychotherapy room in London! I am very happy to invite you to my new psychotherapy room in London! My private psychotherapy and counselling practice is located in Hackney, East London. The practice is in a walking distance from Homerton Station (London Overground).